Having shot at this particular Pier many times over the years, there had long been an empty restaurant location at the beach end. In 2012 construction began on a new Restaurant. 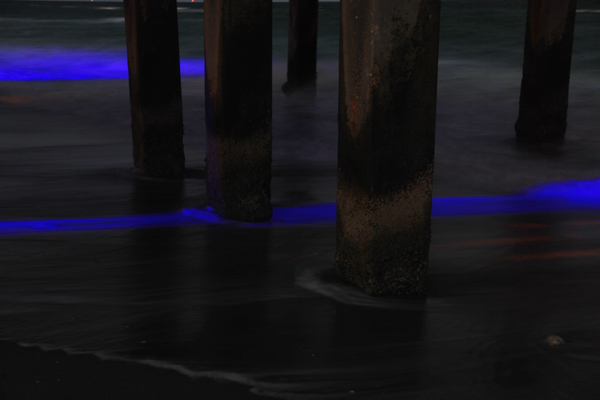 Shooting at sunset one night I noticed that they had installed some blue neon lighting near where the restaurant was being constructed and it eerily reflected blue lines on the surf below it. At my most recent shoot at the location, the restaurant had been completed and was packed with diners. The Quarterdeck Restaurant http://www.quarterdeckrestaurants.com/ at Dania Beach Pier, clearly offers Dinner and a View. It also changes a subject I have shot for a long time, opening up new possibilities for images… and great meals, in the future.